(L-R) Anthony LaPaglia, Kevin O’Rourke (above), Kathryn Erbe. Image by Ruby Washington. In Neil Patel‘s bare bones set fashioned of hidden drawers and convertible beds and windows with changing views and a 2nd floor playing space, augmented delightfully with animated projected line drawings by Darrel Maloney that literally draw details as needed for each new scene before they fade away, a cipher of a man who has been a cipher in American history receives a surprisingly humanistic treatment. Director Terry Kinney gently and efficiently directs Douglas McGrath‘s play. Anthony LaPaglia as Richard and delicious Kathryn Erbe as Pat, in the period prior to the Watergate and other dangerous and tormented years of Nixon’s soul (for which our country suffered for years go come) through individual ambitions and family formation. 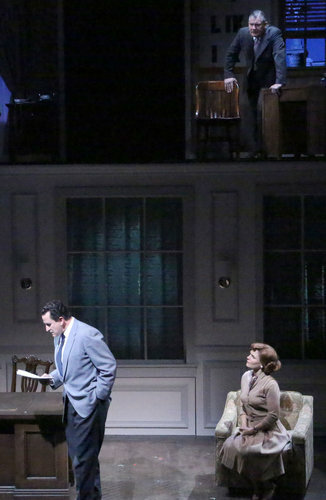 In the end, in Erbe’s hands, Pat Nixon’s humanity is illuminated while Richard Nixon remains the tormented soul who will be capable of misguided and dangerous decisions a few years after the time period covered in this drama. In my heart the character of Pat takes on dramatic dimensions while Richard is given perfunctory life in this script. There is important history present here — a moment in the history of politics and media where a televised speech (the “Checkers speech” named for a family dog by that name) during the 1952 Presidential campaign elicited public support for Nixon, then General Eisenhower’s held-at-a-distance VP candidate. This social media campaign of the day (a televised speech and a call to write letters to telegram one’s responses), our play argues, prevented Eisenhower and his Ivy League staffers to drop lower class wild card Nixon from the ticket as they wanted. It was class and style, so the playwright argues, and historians might agree. The playwright moves between this 1952 campaign and some years later when Nixon reneges on his promise to Pat to stay out of politics to re-enter — at this point the threads are many and the emotional through line is confused a bit. We care about Pat and Richard is a hard man with whom to empathize. In the life of a man who dangerously thwarted Constitutional protections and amped up American participation in the Viet Nam conflict before finally ending it — this essentially domestic drama writ large can feel, upon reflection, to be quite beside the point. Nixon elicited public approval for his candidacy and his status and a lower class guy in an upper class man’s game. (And yes, almost entire a man’s game, politics, in those years.) All that is intriguing, then we move on. A solid script that incompletely integrates history and imagination and a marriage in the wake of politics and ambition. A set that fascinates me, seriously fine performances all around, and Erbe’s Pat who haunts you and sets the mind to dreaming of more theatre to be created out of her world.